On November 1st, the Gustavus Annual Fund hosted an outdoor event for current students to learn the important role of philanthropy in maintaining an institution lik e Gustavus. 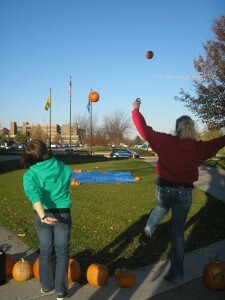 Outside of the Campus Center, there was music, pumpkin throwing, hotdog eating, and piggy banks! Fun contests and trivia informed a steady crowd of students about all the things students use daily that are provided by support to the Annual Fund. This event was one of three in a series drawing awareness and garnering support for the Annual Fund. The Current Student Philanthropy program, initiated this year, is an effort to educate students and grow a culture of giving that becomes an integral part of what it means to be a Gustie.